NZ Rally-O - What is NZARO RallyO? 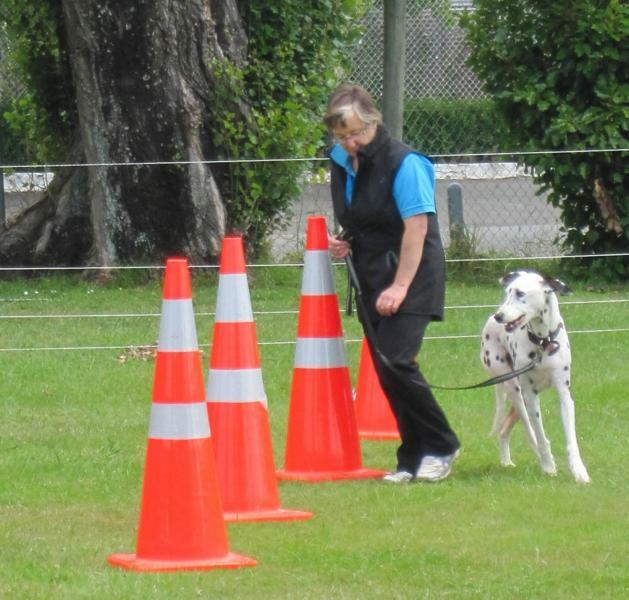 In RallyO the dog and handler team navigate a course of 10 or more stations. Each station has a numbered sign which directs the team to perform an exercise such as Sit-Down-Sit, Straight Figure 8, Send Over Jump, Recall Over Jump, serpentines, spirals, changes of pace etc. The number and difficult y of the exercises depends on the level being worked at. NZARO offers Standard Rally, Zoom and Handy dog options. In Zoom there are no stationary signs so the course is non-stop activity, and there are some unique NZARO signs such as circles for extra interest. In Handy dog more Kiwi-only signs and obstacles have been introduced. These include the labyrinth, ladder, weave, tunnel and perch just to name a few. 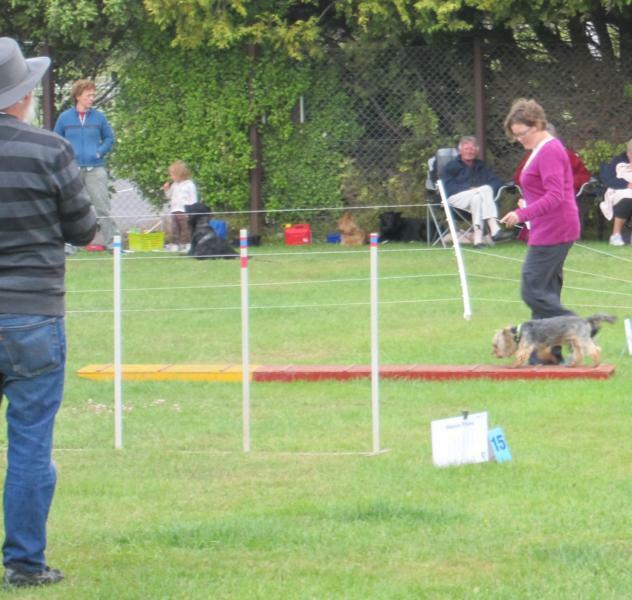 There is also the added challenge of changing sides, with the dog being worked on the right for part of the course. Left: Dougal works on Liz's right side. 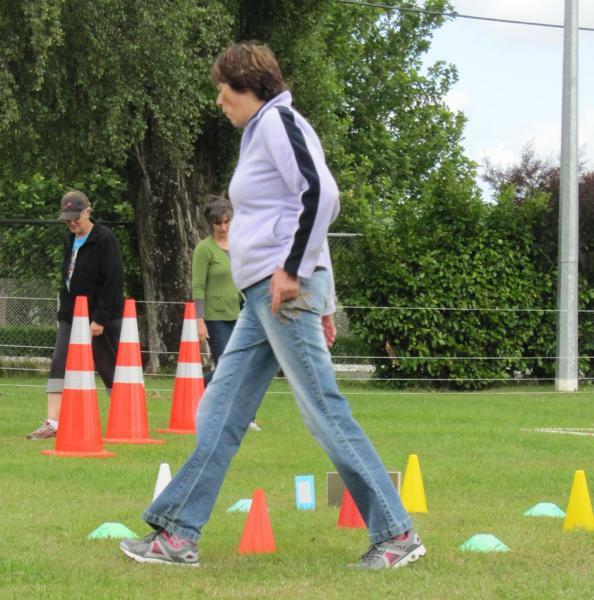 Handlers get the opportunity to walk the course to familiarise themselves with the layout and exercises required. After the Judge gives them the start cue (Are you ready? Forward) they must negotiate the course without direction from the judge or steward. Teams are timed over the course and in the event of tied scores, the fastest time wins. This helps to encourage a brisk, happy pace. Communication between handler and dog is encouraged. Whilst perfect heel position is not required, there should be a sense of teamwork between the dog and handler. 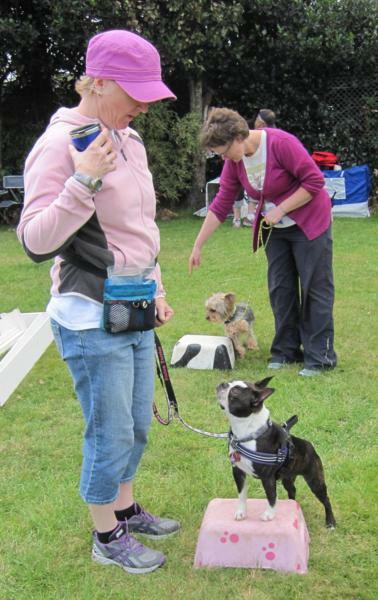 Handlers are encouraged to talk to their dogs during the performance, however loud or harsh commands or intimidating signals are penalised. In addition to being a sport in its own right, RallyO serves as a useful foundation for other dog sports. 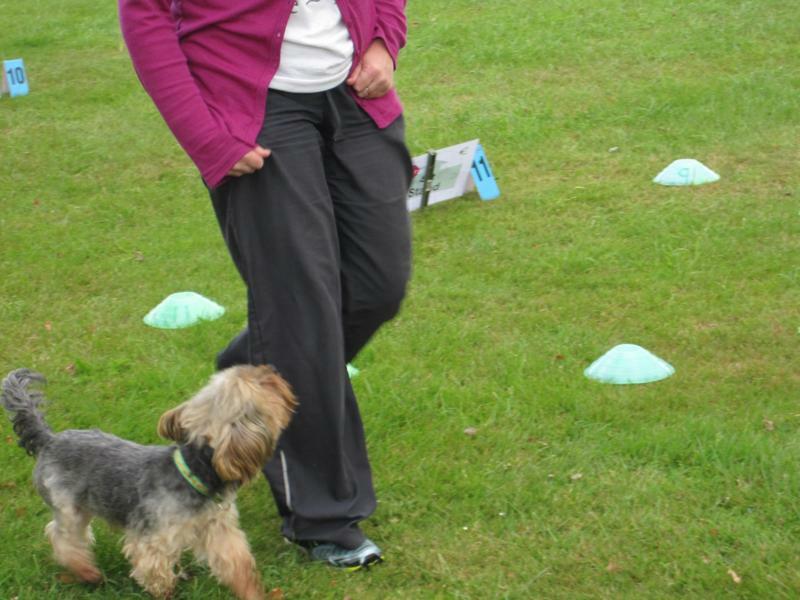 RallyO promotes fun and enjoyment in the training of dogs for handlers of all levels of experience. It provides interest and the opportunity for the acquisition of a variety of skills for the young dog not yet ready to enter other competitions, and also provides something for the older dog that may no longer be able to pursue more active sports such as agility. RallyO helps to produce dogs that enjoy behaving well, and that have been trained to behave in the home, in public places, and in the presence of other dogs. Watch video showing some Handy dog moves.